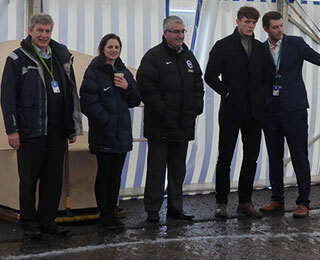 Laura Collins, Projects Manager at the Club’s Amex stadium, was tasked with commissioning a company to produce a giant Seagulls crest on the stadium concourse. 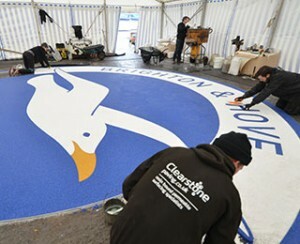 Clearstone was chosen for the project as they are a specialist resin bound surfacing company with expertise in producing custom paved logos. And they admitted they are themselves Albion fans! Martin and Laura came and checked on progress. The crest was created by Clearstone in a Vectorworks CAD program, from which intricate stencil formers were laser cut for the seagull, its beak and the lettering, which were then carefully pinned in place by Clearstone’s installation team.